Food tracking apps are a lot like our diets: we try them with good intentions, but find them too tedious and give up in a few short weeks. 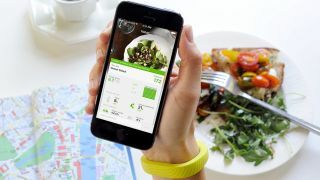 Knowing this Jawbone, the maker of the Jawbone Up and newer Jawbone Up24 wearable, is revamping the food logging experience of its Up app for iOS to make things easier. This comes in the form of a smarter food database that, for one thing, surfaces commonly paired foods. Enter eggs and it'll suggest bacon, toast, and potatoes. After a while, food that you log more frequently rises to the top so that its front and center. This truly makes Jawbone's "personalized food library" live up to its name. Even better, when eating out, the Up app now pulls menus from dining establishments nearby based on location. It takes a few steps out of the tiresome search process. This has always been easier for larger establishments and chain restaurants. But, as we said in our Jawbone Up24 review, what about that that small Indian restaurant down the street? That's where Jawbone's "data science team" comes into play. It aggregates data entered from individual users and makes it available for the rest of the Up community. It even takes advantage of small, but growing food delivery services, starting in San Francisco and Seattle, that automatically log meals and nutritional information. Since the release of Jawbone Up24, the company has a few steps ahead of the Nike FuelBand SE and now-recalled Fitbit Force and still-available the Fitbit Flex. Now, the updated Jawbone Up 3.2 companion app brings expanded food logging and scoring features to ensure wearers pay attention to more than just automated steps and sleep tracking metrics. It isn't perfect, but it's easier than previous food logging apps and should get better over time. The update is currently rolling out to iOS devices today. Expect the same advanced features to make their way into the Android app, which Jawbone Up supports, and, quite possibly, integration into Apple's data-aggregating iOS 8 Health app later this year.